The REDY2GO reservations, dispatch and account team are dedicated to delivering a quality experience to each and every one of our customers in a new and exciting way. Each member of our team offers a wealth of experience in transportation services, and all share the enjoyment of the dynamic travel and tourism industries. If you're ready travel, we're ready to help! The REDY2GO shared ride service is unique in Australia and requires a strong team approach to make it happen for every flight, every day 24/7. We are proud of our drivers and staff and their commitment to quality service and innovation. We hope you feel the same! Whether you're headed to Sydney Airport or need a point-to-point charter shuttle, you can trust the whole REDY2GO team. 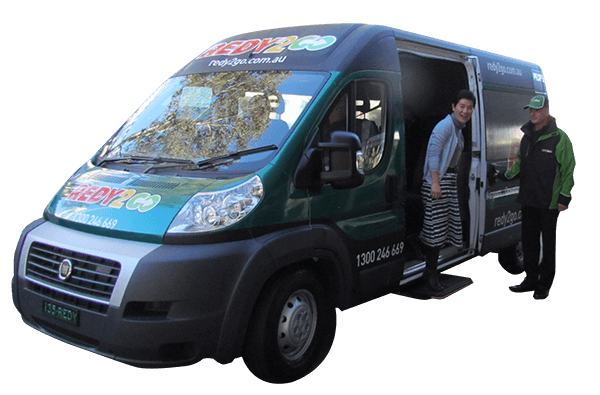 REDY2GO is best know for our airport shuttle services in the Sydney metropolitan area. Our shuttles leave Sydney airport terminal for all downtown hotel locations every 30 minutes. If you're looking for our shuttles, we're easy to spot with our unique Black & Green design with REDY2GO on the side.